The Incubation Series is an interdisciplinary collaboration between students in the Fine Arts and History of Art graduate programs at UPenn. 2018-2019 programming is supported in part by a Grant Award from The Sachs Program for Arts Innovation. 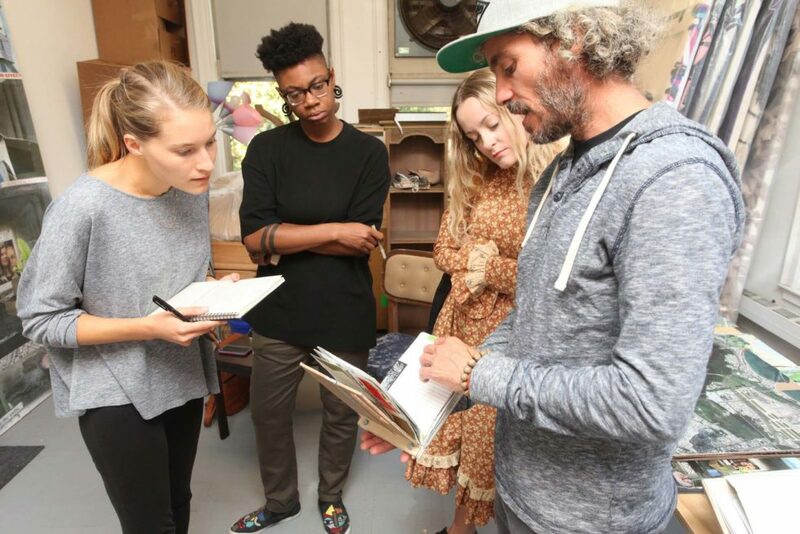 Image: Curators (left to right) Ramey Mize, Tamir Williams, and Isabelle Lynch conduct a studio visit with Heryck Tomassini. Title Magazine partners with The Incubation Series at Penn for a series of articles highlighting the program. The Incubation Series is a student-led arts initiative developed by members of the Fine Arts and History of Art graduate programs at the University of Pennsylvania. Title Magazine, an online art publication out of Philadelphia, has announced that they are partnering with The Incubation Series and will be publishing a series of articles highlighting their work. The first article to come of this formal partnership is an interview by Kaitlin Pomerantz (MFA ’16) and Meredith Sellers (MFA ’12) with Jeff Katzin and Ramey Mize, both current History of Art graduate students. “The partnership immediately makes sense,” he adds. It’s true, and the program, which is the first formal partnership between the History of Art and Fine Arts programs, has become a real asset to the university. The Sachs Program supported its 2018-19 programming with a grant made in 2018. One of The Incubation Series’ recent exhibitions, Weak Link, was also featured in Title through a reflection piece on curating by the exhibition’s two curators: Tausif Noor and Ginny Duncan. Noor and Duncan commented that, in curating Weak Link, they were thinking about how an art “exhibition [could] demonstrate the learning process…” This thinking is reflective of the ethos of The Incubation Series: providing a space for peers to learn from one another, and to to foster new ways of making, exhibiting, and seeing art. It’s exciting to see The Incubation Series fostering these connections, and it will be exciting to continue to see Title highlight them.